There are currently 5,008 users on this website. I wish I had more to go on but I am not the one that soaked the stamp off of the envelope. It is a near a certainty that it is an 1851 cancel and could well be a Massachusetts town. Sinclair - your stamp has a beautifully sharp impression and fresh vibrant color. No doubt that this is a 10A. Gash in shoulder implies that it is from the top row of the sheet. As for the cancel, all I can say is that it happened on November 11 in a town with an 'o' in its name. Based on its location above the date, it looks like the middle letter of the town name. There's not an awful lot more to go on. I hope somebody on the forum just recognizes the font and layout of the town name in this cds, so you can get your answer. It looks like quite a nice 3c 1851. I see a tiny 'break' in the right outer frameline. I am not aware of such a break, so wonder if there is a tiny facial scrape on the right side. If so, it's just a small fault on an otherwise striking stamp. Thanks for showing it. as an early US "newbie" great to see the emission up close, and hear it appraised by knowledgeable members. The second last letter possibly an "R" ? I presume the "gash" is the mark above the button. rod222 - the Gash On Shoulder variety (as listed in Scott) is that line of color just above the button that you mention. The GREAT majority of those are on the top row of the printing plate, so they are a good (not perfect) indicator of location on the sheet. There are a few misplaced impressions that are NOT on the top row, but not many. It is certainly not rare, or even scarce, but is at least an item of note. If you are into plating the 3c 1851, it will help to rule out ~90% of the sheet positions. What this particular example has going for it is the tack-sharp impression. After 165 years, many of these stamps are not nearly as clear as this one. Some are quite muddy and (frankly) ugly. You don't miss much. The break in the frameline is noted on the back of the stamp as a plating mark. 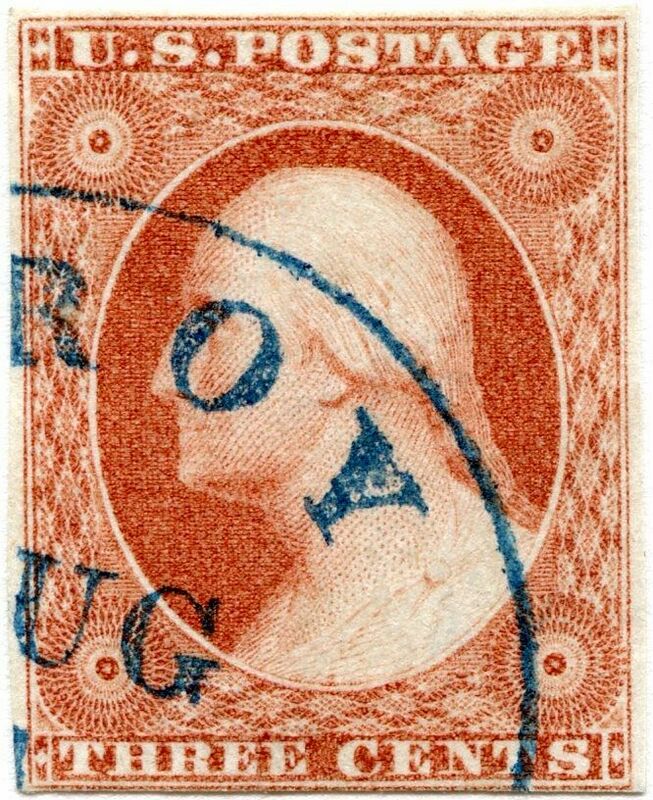 However, it does not appear to be a constant plating mark of 43L1E, which this stamp is. There is some indication that something was on the paper before printing and then came off post-printing. The impression is sharp because it is on part India paper. Part India stamps are considered to be the very first impressions from Plate 1E and in fact the very first 3c stamps printed of the entire issue. They are fairly scarce. I was thinking the letter preceding the "O" was a "B" and I was also thinking it was a Zevely style/produced canceling device. I should probably add that CT and NJ are also decent candidates for state of origin. Almost all of the C-relief, "gash on shoulder" positions are concentrated on the top rows of Plates 4, 6, 7, and 8. Oh, and I am glad you guys like the stamp. I do too! Unfortunately, I may never be able to figure out the cancel even with the help of the SCF community. does this indicate a two pass printing process? Amazing...I think you nailed it CC. Thanks, rod, but I'm already having some doubts about Troy. 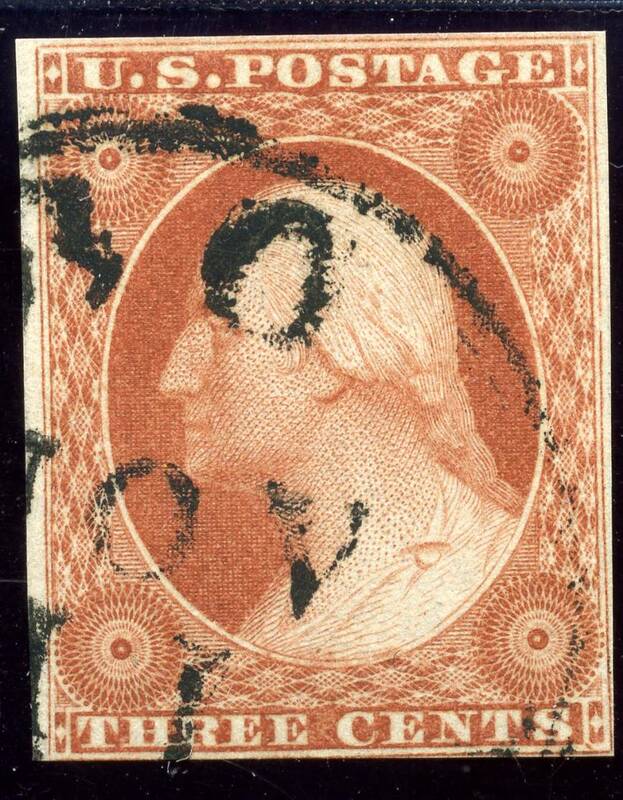 The Troy CDS seems to be a fairly common one, but it would be helpful to know if it changed designs and color in a certain sequence over time (like the Philadelphia CDS did (https://www.uspcs.org/stamps-covers...t-10-and-11/). 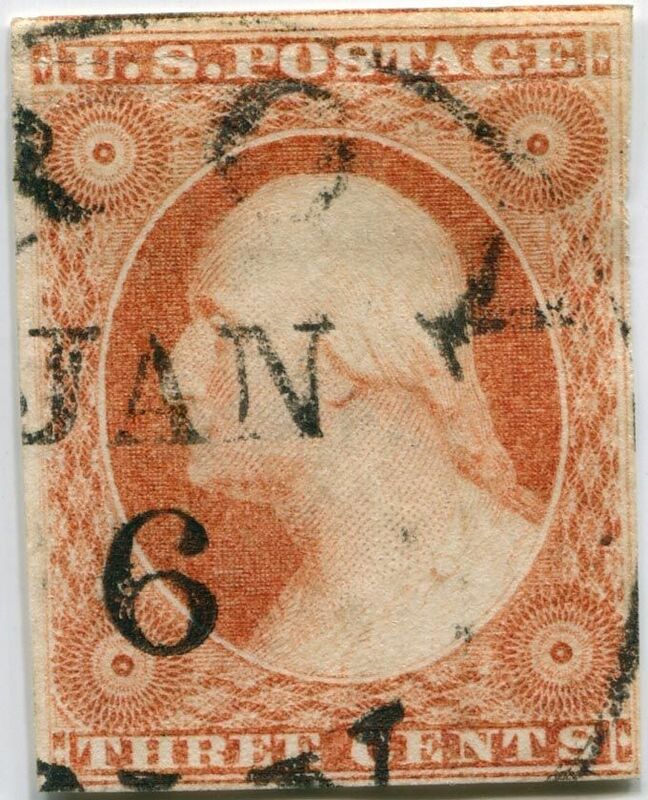 The Jan 6 plate 4 example above would have been used in 1855 or later, while sinclair2010's stamp was almost certainly used in November 1851. I think the first letter showing on sinclair's stamp is a B, but Boston is out because the third letter has two serifs at top. The "2 serifs at the top" teases a wrong assumption, they are too close together to match the type. If it was TROY that would suggest at 3 hammers of differing types. Postmarking can be a cruel mistress. The ring circumference would suggest a 5 letter town? Many other states have cities/towns named Troy, including AL, IL, IN, ME, MI, MO, NH, OH, PA, VA, and VT. Believe it or not, I collect Troy covers/cancels and the pictured stamp doesn't look like any I've seen from there. Sinclair, you indicate that the cancel is probably from MA, CT or NJ. Why do you say that? Was this in a lot from those states? Are reports of part India paper from those states? Just curious. Now that you say it, it DOES look like a part India example - tack-sharp impression, and all. It didn't even occur to me before you said it. Thanks! Rod, you have noticed something about this stamp that has always fascinated me. The 4x rosettes in the corners are NOT perfectly arranged. The UL one is much closer to the left frameline than the UR one is to the right frameline. This is just the way the design was 'built'. They are all that way. The entire sheet of stamps is printed in one pass. This design 'error' (if that is what you wish to call it) is part of all the stamps of the issue. Throughout the life of the issue, there were many re-entries and strengthening of various features of the design, as the plates wore, but this aspect of the design is a constant. Much of the design between the top and bottom labels, outside the portrait oval, was machined. I suspect originally, when the rosettes were being machined into the reliefs, that the machining was slightly out of 'register' (Perhaps the wrong word) with the rest of the design at that point. Perhaps Chase discusses this in his book and has a theory as to what happened, but I don't know. It took 1.29 seconds to lick this stamp.